Understandably, not everyone can appreciate the science fiction motif, and I get that. My wife does not appreciate science fiction, and I get her; however, in defense of the of the motif, science fiction stretches the literary landscape to a point where dreams are born. 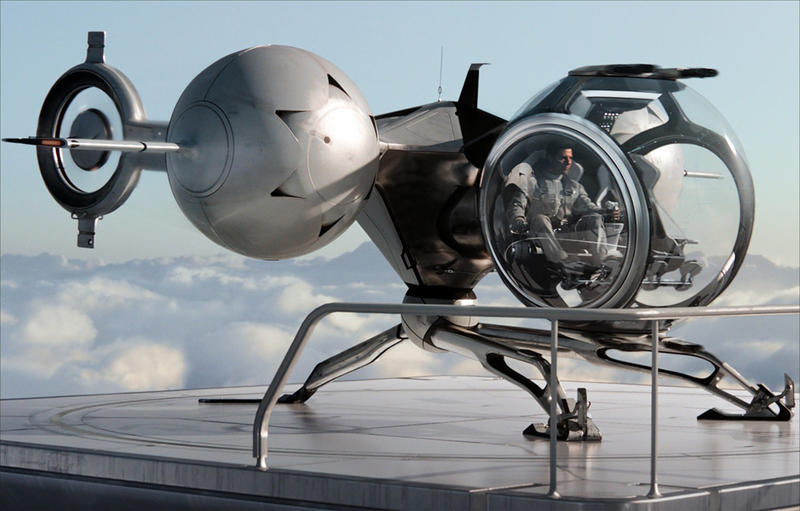 Science fiction translated to film, especially with today's special effects, is a marriage of two perfect, complementary art forms, and to be benefactor, such as myself, one has to suspend disbelief to that point where belief becomes the reality of what could be. And what became of Earth after the alien invasion was a sight to behold, and not in a good way. Remember the old alien films where the aliens were of such a higher intelligence - noble near to the point of deification. 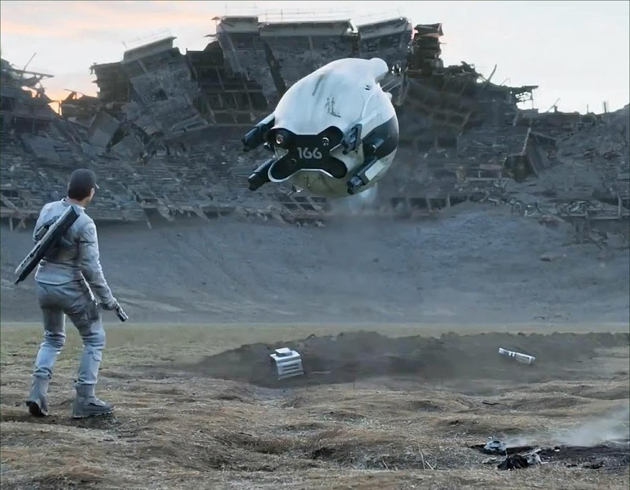 Well, those films are near gone, and "Oblivion" is the poster film that aliens may not wish us all that well upon any encounter of any kind. For all of those nonviolent folk, who want to believe that humans are the higher intelligence aberration, and all possible others - the aliens - are kinder, gently, well: Do the math. 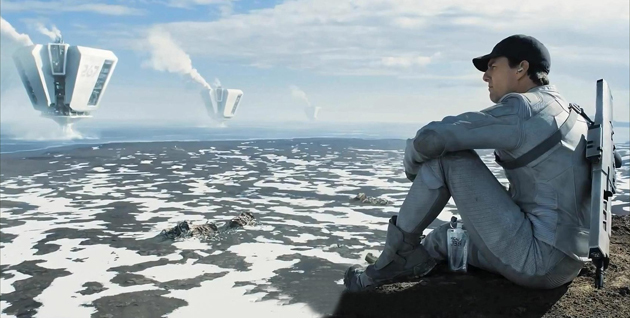 Any alien civilization that travels to earth will travel from a very long way to find us, and we will obviously be the first habitable planet along the way or they would have ceased their search already; so do they wait another minimum 50 earth years of travel, or do they ponce on the opportunity to devour and survive without the wait? I'm not an alien, but I vote that they would ponce. 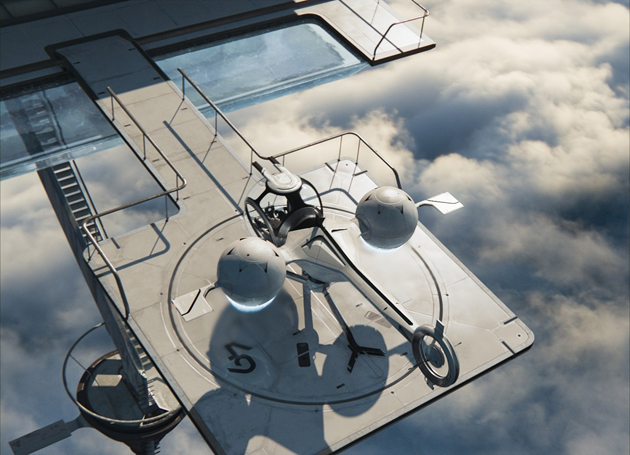 Obviously, Director Joseph Kosinski, who also wrote the unpublished graphic novel that this film is based on, projected a variation of this precept, with the continuance of Earth in the balance. And these aliens, which are more of the android variety, are a particularly nasty lot, who used the pure physical environment that sustains our natural world to murder most of those that inhabit it. In short, they gave our one moon their best shot, fragmenting it in varying chunks, and thereby destroying this Earth's equilibrium of gravity, the result of which was earthquakes, volcanoes erupting, and most damaging of all - tsunamis - huge tsunamis. 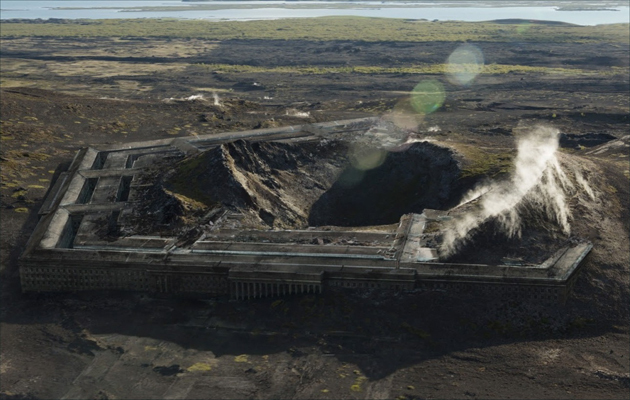 Accordingly, Director/writer Kosinski's story takes place in the northeastern section of the United States, especially in what was once the New York region, to illustrate the severity of the cataclysmic effects from marginalized moon upon a once highly populated area. The destruction and loss of life would be horrendous in that scenario. 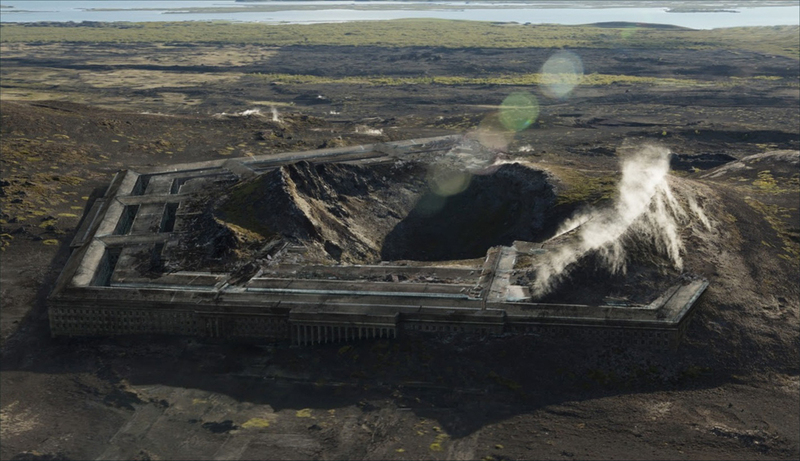 The bleak landscape from that assured calamity was stark, and set this stage - much of it built by outstanding computer graphics, the balance from shooting on location in Iceland - for a story that would be of a dire nature, with any measure of hope a welcome relief. 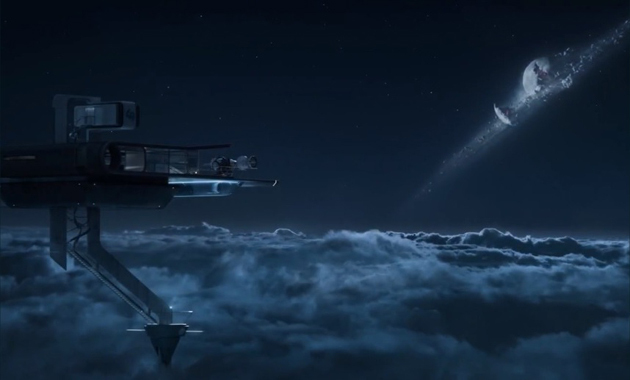 The skyward lair of Jack Harper /Tech 49, Tom Cruise's character, far above the tsunamis, the earthquakes, etc, which must have been of an alien design, and so was the near obliterated moon: Above. 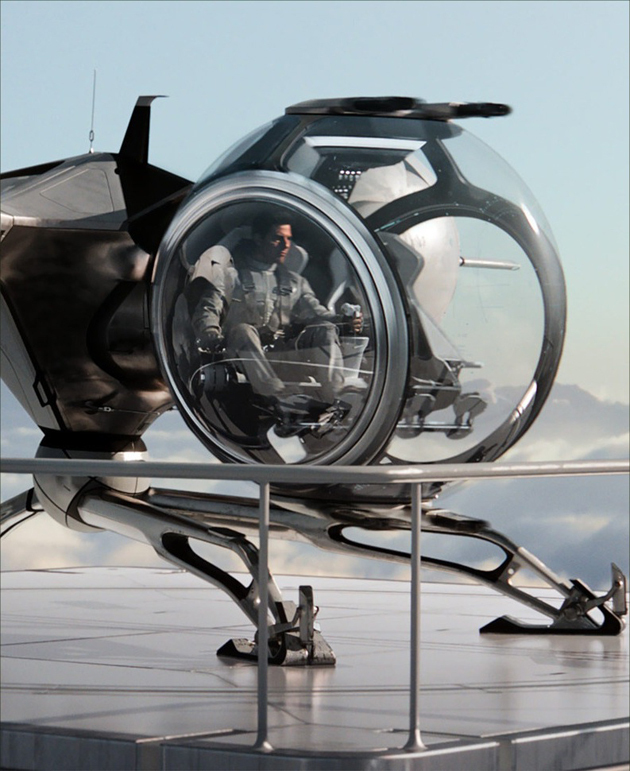 Jack Harper, Tom Cruise, takes a moment to consider his world, and most especially the hydrogen excavators /nuclear reactors /turbines harvesting hydrogen and creating energy just off the Atlantic shore: Below. Click image to expand. That promise of hope was far from a reality with the landscape flattened to the horizon, devoid of any evidence of human kind. 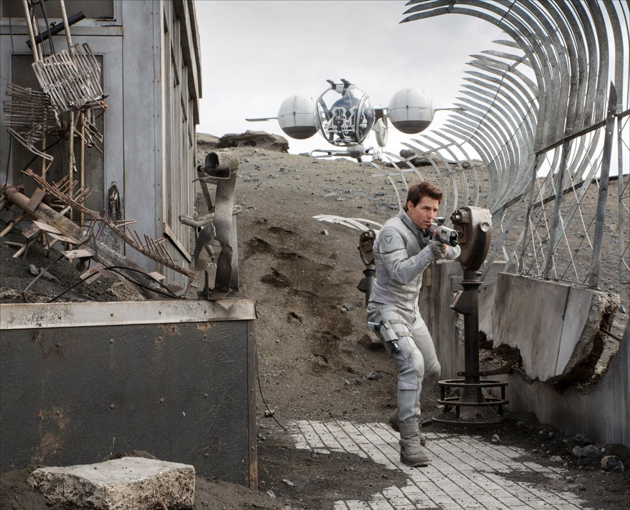 The only human kind known by Jack /Tech 49, Tom Cruise, was his 'effective' Teammate, Victoria, played by Andrea Riseborough, who ran the base in the clouds, while Jack, as the resident tech expert, kept the drones in good repair to ward off the enemies in his midst. The narrative understood by Jack was: That there had been a battle for the preservation of earth, and the humans won but at a great cost - we had to use our nuclear arsenal, which rendered so much of the land uninhabitable due to the radiation. This was alleged to have occurred 60 years ago, with all of human kind that did survive forced to live off of the planet in a massive space station orbiting the earth - a space station so large that it looked like a rather large moon from the Earth's surface. 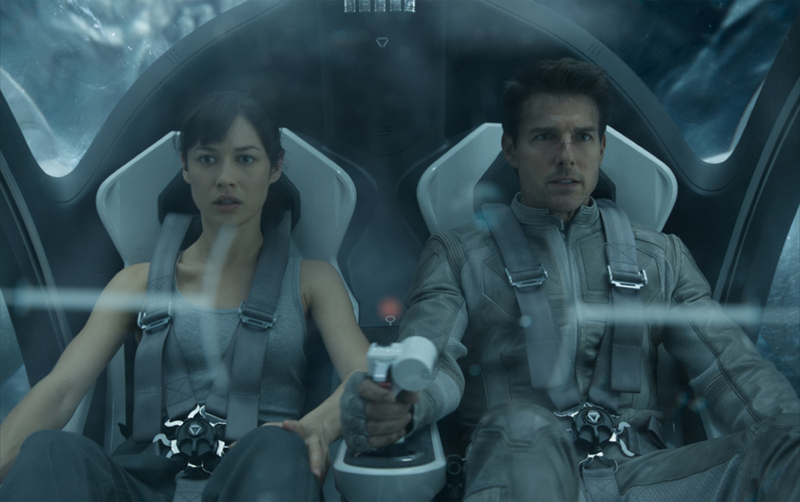 The only humans allowed to occupy Earth were the Tech teams, to fix the drones and other hardware, like Jack and Victoria. 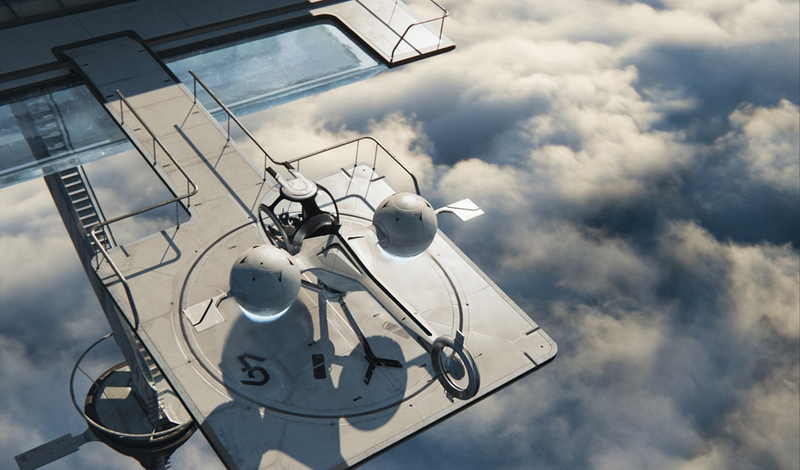 Jack's (Cruise)and Victoria's (Riseborough) home in the clouds, with Jack's rather remarkable flying craft: Above and then below. Click image to expand. 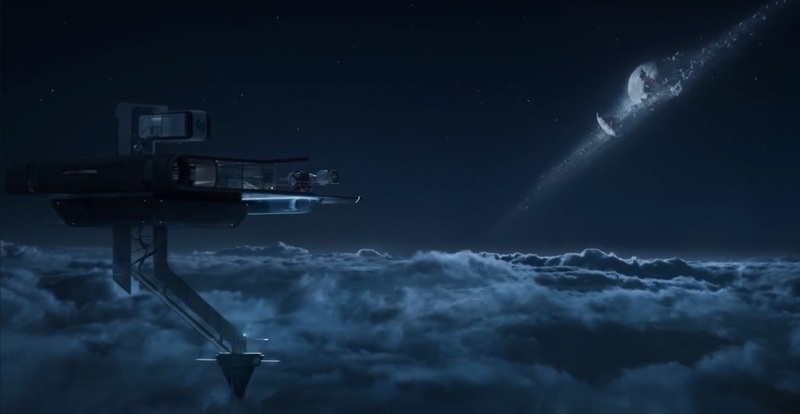 Also an important component within the narrative, understood by Jack, is that his memory was wiped clean by his commanders at the moon-like space station because of security measures. He did not know that he had agreed to such, only that he had little memory, except for a few brief flashes, of his life before his command as Tech 49. 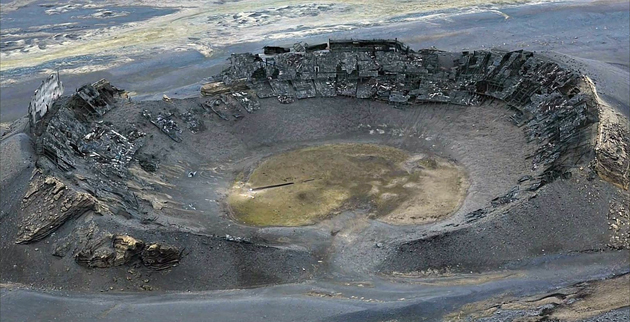 Pursuant to the discussion of the tsunamis, and other natural phenomena brought on by the unnatural destruction of the moon, we are offered the visage of the remnants of Giants Stadium in New Jersey: Above, and then below - the Pentagon in northern Virginia. Click image to expand. Furthermore, Jack was led to believe that the defeated aliens, after their defeat, had assimilated into small pockets of resistance on Earth, and would need to be eventually routed for the Humans to ever have any hope to regain their natural home. At some point Jack would discover that all he had been made to believe, after having his so-called memory wiped, would be a lie. Possibly even the whole of his life. Jack /Tech 49 repairs the drone tasked with the safety and the continuance of purpose of those that occupy the space station /moon: Above. 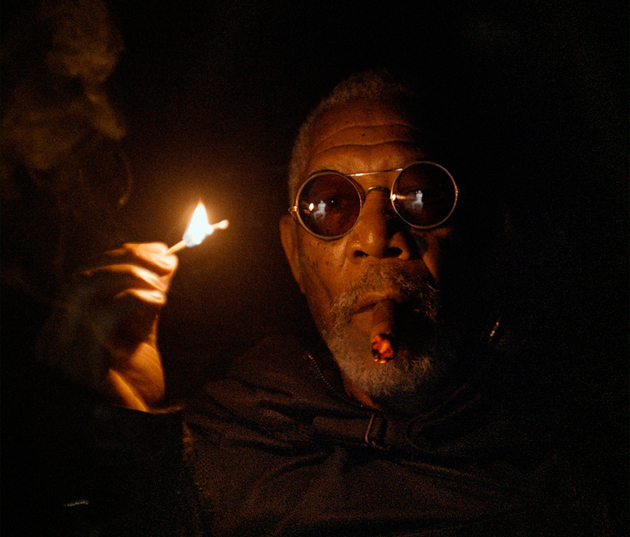 Jack meets another human, not an alien in the Resistance, still on Earth - Beech, played by Morgan Freeman: Below. Click image to expand. As is the way with lies, the truth, however cumbersome, is eventually found out. 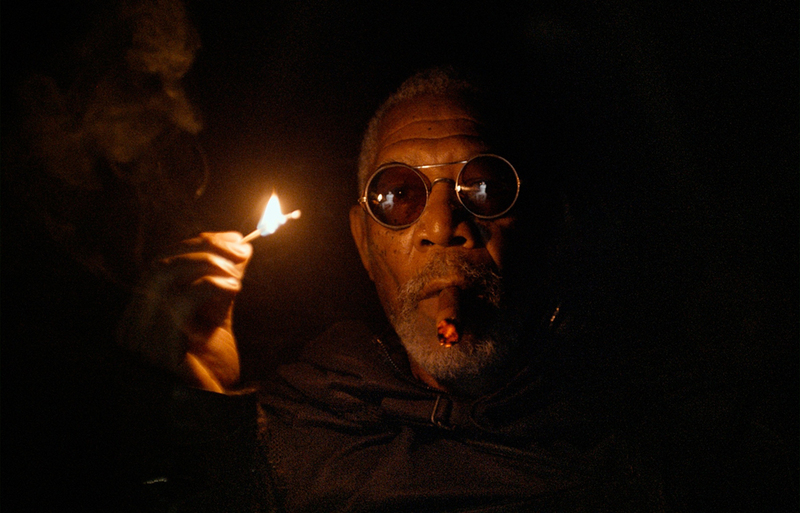 After Jack Harper (Tom Cruise) meets Beech (Morgan Freeman), he begins to discover all that was real and true and how it conflicts with the narrative - the only truth that Jack can remember. Once Jack Harper finds the path to discover the truth about all existence that concerns him, his path is made more difficult; when he discovers an alien beacon within what is left of the observation deck at what is left of the Empire State Building: Above. And when the drones, he has maintained turn on him: Below. Click image to expand. 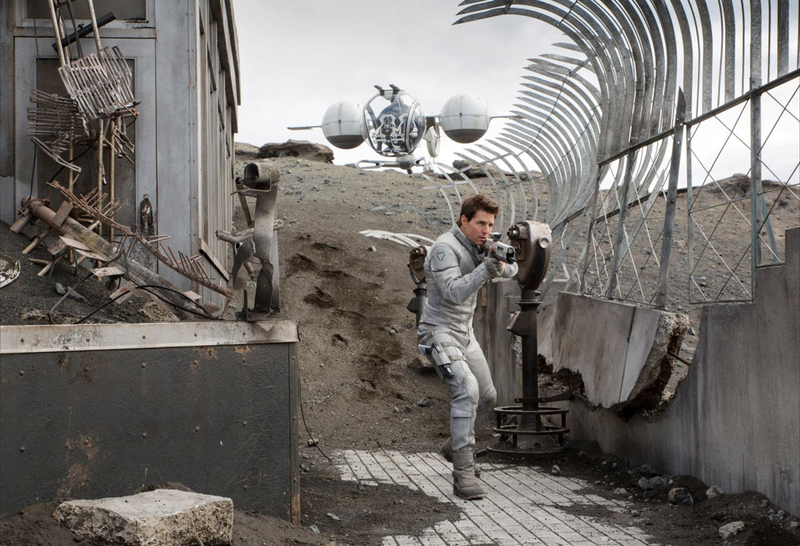 The truth of the matter is that Oblivion is a good film, but, as I mentioned earlier, I am partial to science fiction stories. I grew up reading Jules Verne and H.G. Wells, then J.R.R. Tolkien and later Kurt Vonnegut, Jr., and now, with computer graphics so wonderfully excellent, I enjoy the movies, especially in theaters when I have the time. 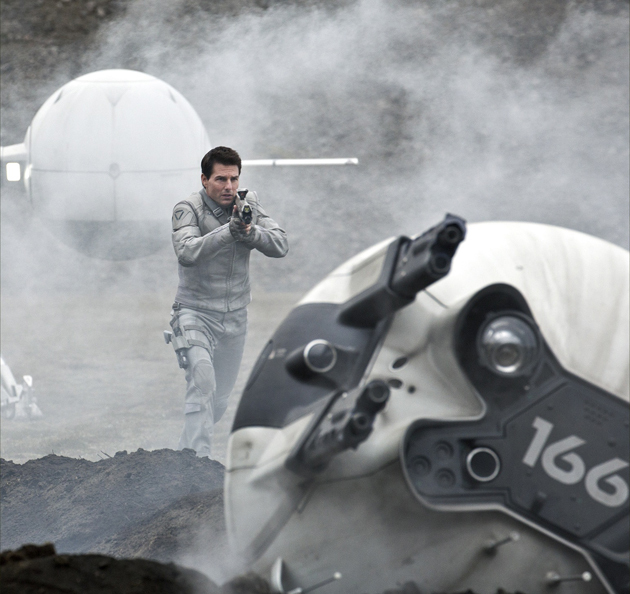 Joseph Kosinski's "Oblivion" did not disappoint, and for that I am thankful. 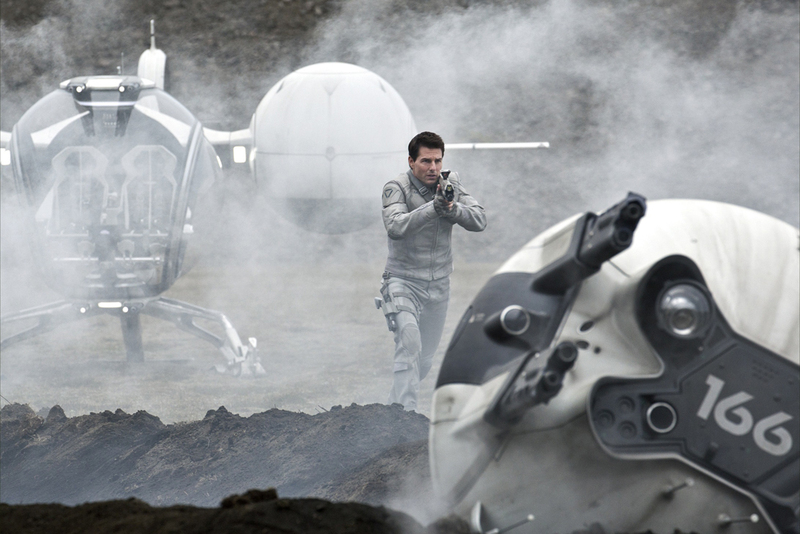 The film had: a full blown apocalypse, aliens, clones, fight scenes against incredible odds, a credible story, eye-popping computer graphics, and Tom Cruise doing his intense acting aura that is the 'gold standard' for this generation of action actors, so what was there not to like. In 125 minutes of runtime, I enjoyed what the film offered, and actually felt that every minute of my time was well spent. What better commendation can I offer than this? Rated PG-13. Released on DVD August 6, 2013. 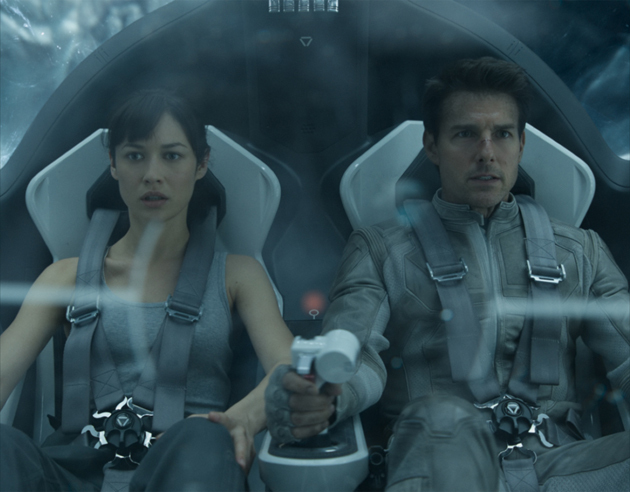 At a critical juncture, Jack Harper (right) is re-united with his best girl, Julia Harper (left), played by Olga Kurylenko, and this is just one more point, when the intensity level has the cause to ratchet-up the anticipation factor just one more level: Above. Click image to expand.